Jason blessed Abby last Sunday and it was such a good day. We had so much support from friends and family, which we appreciate so much. Everything went really well and I thought little Abby was just beautiful. I am so grateful for my little girl! She brings us so much happiness! The whole day I was just overwhelmed with gratitude for my wonderful life and all the special people in it. I didn't want the day to end. I love the darling picture of the whole family. 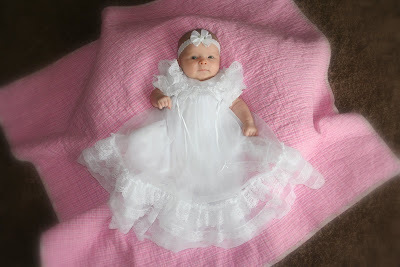 Abby looks so cute in her blessing dress. I am glad you had a great day! Those are the cutest pictures i have ever seen. So glad we could make it for abby's blessing! That first picture is my favorite. She is so cute and little. It was fun having our girls blessed on the same day. I agree they do need to be best friends now! Those pictures of Abby are SO CUTE!!! I am so glad that you got some that show how cute she really is. 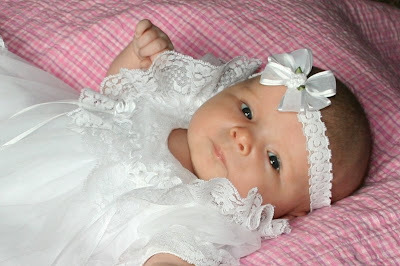 Abby looks like such a little angel in that dress. I just love it. Your fam is so cute! 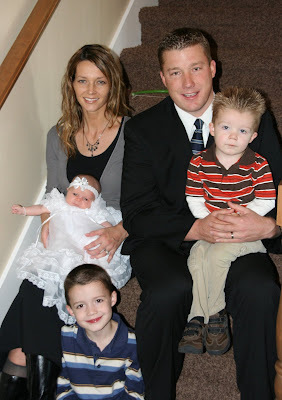 What a beautiful family you guys are!! Abby is so adorable and she will bring you so much joy!! And she's so lucky to have such a fun and gorgeous mom!! Your boys are so handsome and they are getting so big!! Hey. I just wanted to say Congratulations (even if it's a little late). Abby is so cute. I can't believe how big your boys have grown. I came across your blog through Shauna's so I hope you don't mind me reading about your family. I hope you guys have a Merry Christmas.